Spain is one of the most popular countries to visit in the entire world and sees some of the highest tourist numbers in Europe. There are many areas of interest to plan a Spain itinerary, including it’s vibrant capital of Madrid, the Gaudi architecture of Barcelona, the beaches and nightlife of the Balearic islands, and the gastronomy of the Basque country. However, one of the most popular and sought-after regions is Andalucía in the south of the country. Known for it’s diverse landscape, fantastic cuisine, historic cities, and laid-back culture, planning a southern Spain itinerary through Andalucía is one of the best trips you could take in Europe. As one of the largest autonomous regions in Spain, Andalucía is filled with and a complex history and culture unique to the rest of the country. If you’re wondering what to see during a 10-14 day Andalucía itinerary, then look no further. We have had the pleasure of spending months exploring this incredible region and have gained a wealth of knowledge about travelling there. So if you’re wondering where to start when planning a southern Spain itinerary, you have come to the right place! How Many Days in Spain? Before we get into the logistics of our southern Spain itinerary, we need to discuss the best time of year to visit this sunny regions. A good portion of Andalucía is blessed with over 300 days of sunshine per year and, outside of the high Sierra Nevada mountains, the weather will rarely ever get cold enough for it to freeze or snow. Because of this, Andalucía (and the Costa del Sol in particular) is a popular winter destination for northern Europeans looking to escape the cold, dark weather of their home countries. However, while the months between November-March are certainly warmer than virtually anywhere else on the continent, nights can still get chilly and you are more likely to have some rainy days. However, if you plan to visit Andalucía in the summer months, you can expect some of the hottest temperatures in Europe, with some towns repeatedly being subjected to temperatures over 40° C (104° F). While many hotels, apartments, and tourists sites are air conditioned and much of the towns are equipped to handle such high temperatures, it can be uncomfortable to visit during the peak summer months. If you happen to embark on your 10 day southern Spain itinerary between the months of June-August, you can expect inland cities like Seville or Córdoba to have markedly fewer people, as many locals and tourists will have escaped to coastal areas and cities like Málaga. Arguably the best time to undertake an Andalucía itinerary is in the shoulder seasons of March-May and September-November. It is during these months where the weather is at its best — mild yet warm and sunny — and tourist numbers haven’t reached their peak. Now that we’ve determined which time of year is best to go to go to Spain, now we need to figure out how many days you need for your southern Spain itinerary. While it might seem that one region of a country wouldn’t require all that much time to explore, you would be quite wrong to assume this of Andalucía. The region is vast, encompassing multiple major metropolitan areas and various sub-regions and provinces. Each city or town that you will visit in Andalucía will have its own unique character that will beg you to explore more. All this being said, it can seem that no amount of time it sufficient to see all of southern Spain, and you might be correct in this assumption. However, if you don’t have a lifetime just to devote to exploring one region of one country (like everyone else), plan to set aside at least ten days for a southern Spain itinerary. In ten days, you can see a lot of the region without being too rushed and really get a feel for the culture and history. While you likely won’t have time to visit every city and town of interest in Andalucía, 10 days is enough to give you a very good feel for the region. If you have a bit longer to spend, then the absolute ideal amount of time to spend in Andalucía would be about 2 weeks. This will allow you to visit all of the major metropolitan areas of the city and get a little bit off the beaten path. If you only have 10 days for a route through Andalucía, there are a few different routes you could take through the region. However, by far the most popular itinerary for Andalucía would be the Seville-Córdoba-Granada route. These are three of the most dynamic and historic cities in the region and are absolute must-visits whenever you are in southern Spain. While many people like to hire a car when exploring Andalucía, if you go on this 10-day Spain itinerary, having your own rental car isn’t entirely necessary. The stops on this route are all easily accessible by bus or train and each city itself is quite walkable. Where you might find a car more helpful during this Andalusian route is if you want to go on some more off-beat day trips that don’t have frequent or easy connections via public transport. If you’re thinking of renting a car in Spain, we recommend using RentalCars.com to find the best rates. We also would suggest to take out a third party insurance policy with iCarHireInsurance to avoid paying the excessive fees through the rental car agency. The capital of Andalucía, no 10 day southern Spain itinerary would be complete without a stop in the dynamic and historic city of Seville. One of the most beautiful cities in Spain, Seville has a ton to offer tourists and it is one of the best cities to get to know the unique culture and history of Andalucía. Seville is the fourth-largest city in Spain and therefore is an easy starting point for a route through southern Spain as it is well connected both because if its international airport and frequent buses and trains from all major Spanish cities. Due to its size and historical significance, there are also a lot of things to do in Seville that you can easily spend 3 or more full days exploring the city. Plan to spend a couple of days in the city itself, checking out monuments like the magnificent Seville Cathedral and Real Alcázar, which could easily occupy at least half a day. It is also worthwhile to visit the former Jewish quarter of Barrio Santa Cruz, the futuristic Las Setas, and the vibrant Triana neighbourhood on the other side of Guadalquivir river. In this itinerary, I suggest spending 4 days in Seville with the intention that you can spend one or two of those on a day trip to a nearby city. Popular day trips from Seville include the cities of Cádiz and Jerez de la Frontera among many others. Hostel One Catedral —If you’re travelling solo or have a tight Spain travel budget, this hostel is a excellent choice. It is one of Seville’s highest-rated hostels and it is located within easy walking distance of sites like the Cathedral and the Alcázar. They have a range of dorms and private rooms available and the staff organises social events and activities. Click here to see thier latest prices! Hotel Bécquer — This centrally located hotel is a great choice if you’re travelling on a mid-range budget but want to be close to all of the action. They have numerous clean, comfortable rooms available and they also have a wonderful rooftop pool and terrace to take the edge off of those warm Seville days. Click here to see their latest prices! Monte Triana — Located in the vibrant Triana neighbourhood, this swanky boutique hotel is on of the highest-rated in Seville. Located within a 15-minute walk of all of the top sights of the city and close to some of the best tapas bars in Seville, they have a number of luxurious rooms available. Click here to see their latest prices! Airbnb — Airbnb can also be a great option for your entire Spain itinerary, not just Seville. There are numerous listings in every city on the platform, ranging from a room in a local’s home or an entire furnished apartment. If you’re new to Airbnb, you can click here to get up to $40 off your first stay! Not quite what you’re looking for? Click here to browse for more hotels in Seville! After spending your first four days of this 10-day Spain itinerary in Seville, it’s time to head to another historic city in Andalucía: Córdoba. While many visitors to the south of Spain tend to only treat Córdoba as a day trip from Seville, the city is much better experienced in the two full days I have allotted in this route through Andalucía. At one point, Córdoba was considered to be the most important city in Western Europe and it was the head of one of the most advanced civilizations of its time during the Moorish rule of Spain. Therefore, there are centuries, if not millennia, worth of history to explore in Córdoba and though it’s historical centre might be small, it is much better enjoyed at a slower pace. The Mezquita is certainly a can’t miss sight in Córdoba, however, it is also essential that you spend some time getting lost in the winding, narrow streets of the historic Jewish quarter and visit some of Córdoba’s many other sites. Hesperia Córdoba – This comfortable boutique hotel, located on the banks of the Guadalquivir river, is a great place to stay if you are travelling on a mid-range budget. They have a range of modern, clean and comfortable rooms and also include a rooftop pool to take the edge off of a hot Córdoba day. Click here to see their latest prices. The last stop on this Andalusian highlights itinerary is the incredible city of Granada. Tucked high in the Sierra Nevada, in 1492, Granada was the last city to fall to the Catholic monarchs during the Reconquista. Because of this, Granada’s Islamic roots and history seem somehow more pronounced than in other Spanish cities or cities in Andalucía altogether. Much like Córdoba, Granada is perhaps most famous for its iconic monument: the Alhambra. The fantastic Moorish palace, summer house, and fortress is a sight to be seen and is one of the best examples of Islamic architecture in the world. However, many visitors wrongly assume that the only reason to visit the Granada is for the Alhambra and they neglect to to give the rest of the city’s sights is just deserved. For instance, getting lost in the incredible Albaicín neighbourhood, which was once the city’s Arab quarter, is one of the highlights if visiting Granada. Also, it can be just as rewarding to hike up to the historic Sacromonte area, the traditional Roma quarter famous for its cave dwellings – you will still see some people living an alternative lifestyle in these caves today. There is also a thriving arts scene and some of the best tapas culture in all of Andalucía to explore. There are also a few day trips you could take into the nearby mountains or to other towns and cities close by. For all of these reasons is why I recommend spending at least a full two days in Granada. Granada is one of the bigger cities in Andalucía and therefore it makes it a decent endpoint for this southern Spain itinerary. The city has its own international airport that serves many cities throughout Spain and also some international destinations in the UK, Germany, France, etc. You could also leave from the nearby Málaga airport, which is located about an hour south by public bus. Granada is also well connected to Seville or even Madrid, so it is an easy city from which to leave Spain. If the reason you want to plan a southern Spain itinerary has more to do with the perennial good weather and not as much to do with the monumental historic sites found in cities like Seville or Granada, then this is the itinerary for you. This Costa del Sol route through Andalucía sees you hugging the coast throughout your entire southern Spain itinerary. The first stop on this southern Spain itinerary is the coastal city of Málaga. As one of the premier destinations in Andalucía and one of the oldest cities in all of Europe, Málaga has long been a popular spot for northern European visitors seeking the sun and sand and is seen as something as a haven for the Brits abroad. However, don’t jump to conclusions, as I did, that Málaga is essentially a little Britain with better weather and that it is impossible to seek out any Spanish culture. This is quite the contrary, in fact, as while Málaga certainly sees its fair share of tourists, the city doesn’t exist solely to cater to them. There are lots of cool things to do in Málaga that go beyond lounging on the beach – though visiting the Malagueta beach is certainly a must-do when in this Spanish city. There are also numerous museums, including the small Picasso museum (the famous artist was born in Málaga) and the Museo del Vino (the wine museum!). You can also visit the Alcazaba – the imposing Moorish fortress in the highest hills of the city – and the Roman theatre just below it. It is also possible to go on a day trip to Granada from Málaga or to check out some other, smaller beach towns nearby as well. Hotel Sur Málaga — This centrally-located hotel is a wonderful base in Málaga, situated within easy walking distance to all of the best museums and attractions. They have a range of air-conditioned, clean, and comfortable, rooms available and it is the ideal place for couples. There is also breakfast available for an additional charge. Click here to see their latest prices! Madeinterranea Suites — This is a great hotel if you’re after a little bit of luxury on your trip to Málaga. There are numerous spacious and comfortable rooms on of available, a restaurant on site (complete with room service! ), and a fantastic breakfast included in the room rate. They also can organise and airport shuttle. Click here to see their latest prices! The Lights Hostel — This hostel, one of the highest-rated in Málaga, is a great option for budget or solo travellers looking to meet other travellers and have a good time. They have a range of dorm and private rooms available and a hearty breakfast available at an additional cost. They also organise social events in the evenings, making it a great choice to meet others from around the world. Click here to see their latest prices! Not quite what you’re looking for? Click here to browse other hotels in Málaga! After spending a few days enjoying the lively energy of Málaga, the biggest city on the Costa del Sol, it is time to get a bit off the beaten path in Andalucía and also enjoy some laid-back, small town vibes. And the perfect place to do this is the lovely town of Estepona. Located about 15 kilometres west of the larger city of Marbella, Estepona is one of the few towns along the Costa del Sol that has retained it’s traditional pueblo charm and has resisted the immense commercialisation that has effected a vast majority of the area in the past couple of decades. While there isn’t much to do in Estepona in regards to sightseeing, the town is truly a picturesque sight to be seen. The beach of Estepona is the main attraction, however, the maze of flower-filled, white washed streets are truly something special to wander through as well. There are numerous restaurants and bars in the town as well, located both on the charming seaside promenade and hidden within the whitewashed side streets. Spending a couple of days in Estepona is sure to give you the rest and relaxation that you should be after in this coastal 10 day southern Spain itinerary. Hotel Boutique Casa Veracruz — This boutique hotel, located a stone’s throw away from the beach in the heart of Estepona, is an excellent place to stay while in this coastal town. As one of the highest-rated hotels in the town, the rooms are well-equipped, air-conditioned, and an excellent breakfast is included in the room rate. Click here to see their latest prices! Not quite what you’re looking for? Click here to browse more Estepona hotels! After getting some much-needed rest and relaxation in Estepona, it’s time to head to the final stop on this 10-day Spain itinerary, the historic city of Cádiz. 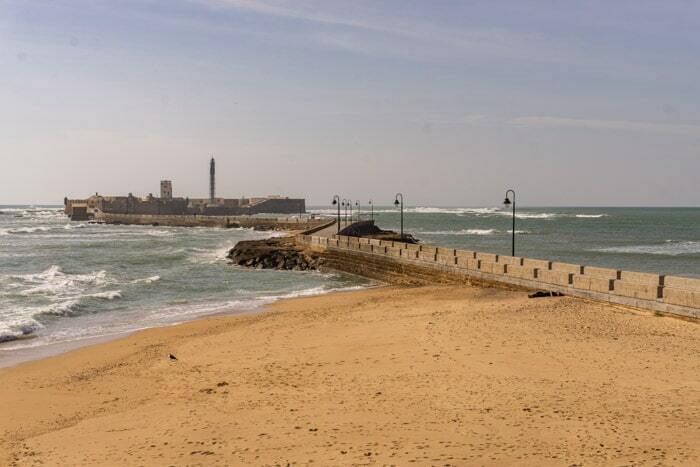 Located on the southwestern coast of Spain, Cádiz is almost completely surrounded by water and is considered to be one of the oldest, continuously-inhabited cities in Europe. Because of it’s age, there is a lot of history to explore in Cádiz, however, the majority of its main sites can be seen in one full day. We recommend spending two days in this city where you can spend one exploring all of the fantastic historical sites in Cádiz, like the Castillos de San Sebastian and Santa Catalina, the Cádiz Cathedral, the camera obscura in the Torre Tavira, along with a few of the wonderful beaches in the vicinity of Cádiz. It is also recommended to spend one of your days in Cádiz on a day trip to nearby Jerez de la Frontera. Jerez is a fascinating little city that is home to one of Spain’s most famous exports: Sherry. They also have a unique flamenco scene and some fantastic tapas bars. The best place to start any route through southern Spain is in the largest city in the region: Seville. Spend four full days here and give yourself time to see all of the main sites, check out the incredible tapas scene, and maybe go on a day trip or two. After enjoying the vibrant energy of Seville, head to the smaller and more laid back Córdoba. This historic city is often regarded as simply a day trip, however, spending 2 full days in what was once the most important city in western Europe will allow you to get to know the culture and history all the better. After spending your first week of your 14-day Spain itinerary in Seville and Córdoba, it’s time to head to the coast and enjoy the lively city of Málaga. Known as the home of Picasso and the place to be for year-round great weather and beachy vibes, Málaga has a lot to offer tourists and is a worthy stop on any 2-week trip to Andalucía. The final stop on this 2-week southern Spain itinerary is in the historic city of Granada. Apart from the Alhambra, which is one of the most popular tourist attractions in Spain welcoming more than 6,000 visitors each day, there is a lot to see and do in Granada. There is an interesting Islamic history in the city that spans longer than anywhere else in Spain and it is also home to a fascinating counterculture. If you have more time to play with when planning your Spain itinerary, there are many different routes and cities you could visit. First and foremost, you could start your trip with a couple of days in Madrid, exploring the fantastic museums, excellent food scene, and some of its unique neighbourhoods. Madrid is well-connected with most every city mentioned on this itinerary, so you can easily get to Andalucía from the Spanish capital. Another option is to spend longer in the bigger cities, to dig deeper and venture off the beaten path. Seville is a city that you could spend many days in and never run out of interesting things to do, as is Granada. You also could add some other, smaller cities onto your itinerary in order to really get a feel for the unique Andalusian culture and lifestyle. Cities like Ronda are popular stops, but places like Jaen and Écija would allow you to get a bit more off the beaten path. If you want to see more of southern Spain beyond Andalucía, it can be worth heading to the Murcia region, located just to the east of Andalucía. There are miles of coastline here and some lesser-known wine country that is worth exploring, as is the modernist architecture and Roman ruins of the port city of Cartagena. No matter where you choose to visit on your southern Spain itinerary, you are sure to leave with fond memories of an enriching and historical experience. Are you planning an Andalucía itinerary? Have you been to southern Spain? Let us know in the comments!